Across the street from the Great America amusement park, a small gathering of augmented reality enthusiasts were building an amusement park of their own. Armed with iPads, Android phones, and high-tech headsets, the people of the Augmented World Expo set about creating a more exciting reality. Though most of the projects held inside the Santa Clara Convention Center last week were nothing more than proofs of concept, they show us all the benefits (and fun) that augmentation technology can bring. Whether it's software that makes you better at pool, a virtual game you can play on a postcard, or a pair of musical pants, our augmented future looks more interesting by the minute. If you think people's choice in cologne is bad, wait until you get a whiff of their phones. Scentee is an app from ChatPerf that lets your iOS device emit odors. The app works with a small accessory that you plug into your iPhone or iPad's 30-pin connector, and there are over 500 different smells to choose from--including bacon and durian, the famously stinky southeast Asian fruit. It's basically like having a Glade PlugIn for your phone, though I'm pretty sure people will hate you for using this in enclosed spaces, like elevators and subway trains. The Scentee app will be available starting in August, and the hardware ccessory will retail for $30. ChatPerf tells me it plans to open up its APIs to third-party developers, so the next app you download on your phone could potentially give you a nose-full of fragrance. Forget about musical chairs, the future is all about musical pants. These Drum Pants, developed by Tyler Freeman of ODBOL (pronounced "oddball") productions, come lined with sensors that produce noise when tapped. Different parts of the pants correspond to different percussion instruments, and the cacophonous pantaloons can connect to a standard amp or speaker for an even louder jam session. Tyler says the pants took him a few hours to build and that he's still working on a way to make the sensors less bulky. His end goal is to get the pants banned in public schools--something I don't think he'll have much trouble accomplishing. Wearable tech and smell-o-vision smartphones might be cool, but everyone knows the best things about augmented reality are the games that leverage the technology. Hermaton is an app for iOS and Android that has you navigating a virtual maze using your smartphone or tablet. You'll need to activate several virtual lights as you make your way through the maze, and take care not to bump into the mesh of pipes that make up its walls. In order to play Hermaton, you need to download and print the marker that the app uses to project the game. 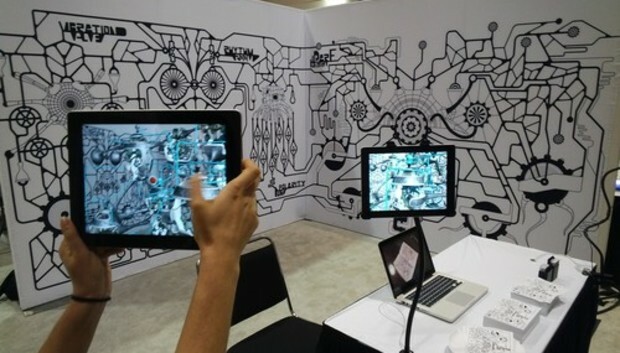 Normally this marker is no bigger than your average sheet of printer paper, but the Hermaton booth at the Augmented World Expo featured a much larger version that occupied most of the booth's walls. Moving through the maze is tricky, so make sure you give yourself enough room to maneuver. Possibly my favorite demo at the show, this augmented reality pool table can turn even the most inept players into pool sharks. The system was developed by the Department of Electrical and Computer Engineering at Queen's University in Canada, and it uses computer vision to keep track of all the balls on the table. When you position yourself to take a shot, the computer uses an advanced physics engine to show you where it believes the ball will go based on the angle of the pool cue. The Queen's University team tells me that with the help of a projector, HD camera, and computer, any pool table can become an AR pool table. The rig is meant to help novices improve their game, but it could also come in handy should you be looking to experiment with trickier shots. There are currently no plans to bring the system to market--though the more tech savvy of us out there could possibly build their own.